I am slow in responding to Dara's blog on your Christmas tree. The decorations that we use here go back to when Doug was young. In fact, we made a few of the ornaments before Jim and I got married. I also have two ornaments made by a long-time friend (met in 1965) and she made them when her husband was in law school - late 1960s - and money was quite short. Several of the ornaments were made by school comrades over the years - most are dated and signed. 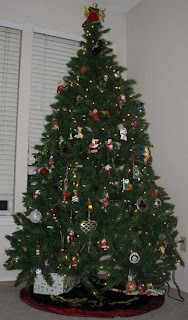 I cherish the time each year when I decorate the tree as memories are revived anew.